We'll help you choose the right telecom carrier network. Believe it or not, connectivity affects every aspect of your business. Even having the best technology won’t get you far if your connectivity isn’t there to support it. 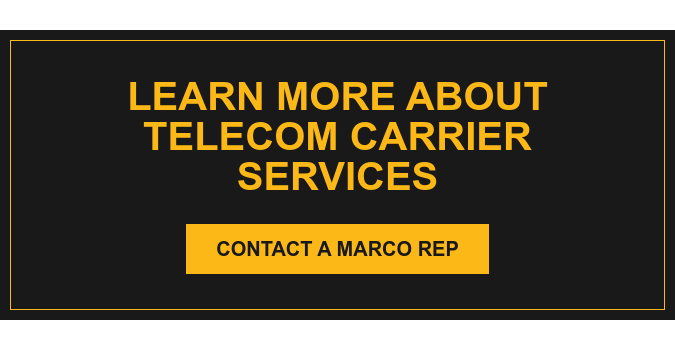 Marco’s telecom carrier specialists keep your organization’s needs at the forefront as they match you with the right voice, Internet, data and cloud services carriers. Need help determining which telecom carrier is right for you? Download your free telecom agent vs. carrier comparison chart to get started. Improve productivity and reduce headaches. By bringing all of your hardware, software and connectivity components into a single, fully integrated system, Marco can improve your network performance and make your life easier. Eliminate time spent researching all of your carrier options. The carriers and carrier solutions available in the telecommunication market are vast and growing. We do the research for you and identify the best options for your organization. Get peace of mind knowing we’re in your corner. We make sure all of the details are covered. We’ll act as a liaison between you and your carrier, ensuring your needs are met, including follow-up installation, billing, trouble reporting and escalation of issues, if necessary. No consulting fees. Ever. When you hear the word consulting, you might assume that there’s a fee. There’s not. Marco’s Telecom Carrier Consulting offers you premier pre-sales consulting services at no cost.